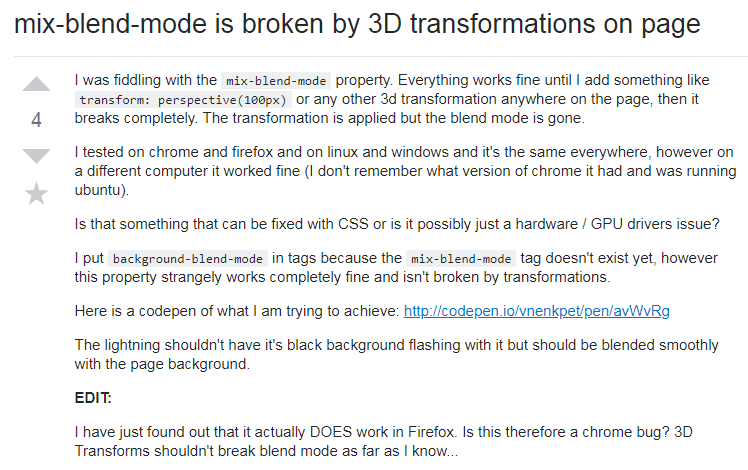 BUG -CSS mix-blend-mode turns off CSS perspective. When we have mix-blend-mode, the closest ancestor that creates stacking context will isolate blending. We create a render surface at the root of this isolated group and because render surfaces don’t support preserve-3d(because they render into separate FBO), we see a flattened result. ajuma@ suggested that this bug maybe much easier to fix after Slimming paint v2 if we can somehow disentangle transforms from layers.